After two years of being off stage, my husband and I finally auditioned for another show and were both cast -- him in a dream role and I in the ensemble. After eleven years of theatre and singing together, watching each other learn and grow, and dealing with my own petty inner voice that often cries, "Don't you wish YOU could do what he does?" I am happy to say that I've reached a beautiful peace and that jealousy is nothing more than a distant memory. 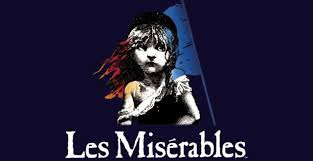 For anyone who is not familiar with the music Les Miserables, it's a fascinating mixture of history and allegory with the most heart-wrenching songs paving the way for the story to unfold. Originally, we knew nothing about the show other than it was 'depressing' and we didn't want to spend a summer wrestled away from our depressing reality only to immerse ourselves into depressing theatre. Then we watched the movie, and what ensued was a quest to become a part of exactly what we've always wanted our ministry to be: using art and theatre to convey the message of Christ and what He offers each of us. I stepped back from my own theatrical desires to rest on my knees and pray that my husband, whom I love and respect immensely more than I could ever have imagined feeling about any man, would land this role because I truly believe that he has the talent and passion to bring the lead role to life in a way that only he can. I know beyond a shadow of a doubt that each of us is born with God-given talents and abilities to further our purpose in this life. As deeply as I feel that mine is writing, I know that his is being on stage. This is his moment -- not to shine for his own self-confidence, but to stand in the spotlight for what God has to say through him. I could not be more proud of him, nor could I be more honored to be a part of a production such as this, by his side, supporting him both on stage and at home. When I said in a recent blog that 'Something's Coming, Something Good'... I wasn't certain what it would be. I'm still not. But I know with my whole heart that this is the next step, and I'm going to keep walking.